Very nice apartment of 42 m² very well equipped, which can accommodate up to 6 people (5 adults and a child). Apartment composed of a large living room with an open kitchen and a dining area. Large terrace facing south with views of the slopes. 2 bedrooms, one with a double bed and the other with bunk beds. In the living room, sofa bed convertible into bed 2 people. Many storage space in the apartment. Independent room for skis and storage of ski boots. - charges and taxes included. - New stove, new dishwasher and new fridge with freezer. Small appliances are new, too. - Numerous storage spaces which avoids "camping "
- Cleaning done at the end of the stay. - Cozy residence at size "human "
The arrival is from 16h and the departure is for 10h. Apartment and residence not designed for noisy and festive nights. Ski boots and skis are not allowed in the apartment or on the balcony. Information and contacts only by email. Apartment located in the residence Phoenix, located 150 m from the slopes, shops and gondola connecting with Plagne Bellecôte. Residence served by road and direct access by the parking lot of Belle Plagne. 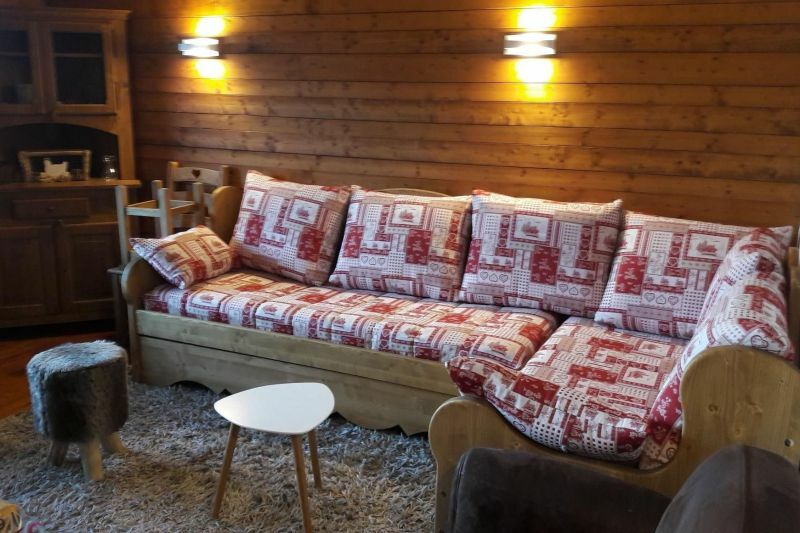 Apartment furnished in chalet style, comfortable and located on the 2nd floor in a family residence of average size. Nice stay in this quiet residence. The living room of the apartment is spacious and the bedroom 1 with a large storage cabinet. Also appreciated the large ski locker for depositing all equipment. Warm welcome from the owner and responsive to questions asked before arrival. Apartment consistent with photos, very well equipped and well located. Quality equipment and very friendly welcome from the owner. Apartment very well equipped and a magnificent exhibition (splendid sight on the mountains and directed south). The owner is very friendly and very accommodating on arrival and departure times. Experience to renew. The apartment is fine, the bedding is immaculate. We had a great holiday. I recommend this accommodation. Contacts and information only by email. Deposit: 500 ? on bank account returned a week after the final cleaning.